I often see people post about recipes that don't require using the oven in the summer. I never really understood that, since I don't feel like my oven really heats up the house - I never knew if it was our floorplan, the air conditioner, or what, but it just never seemed to be an issue for me. And anyway, doesn't everyone have air conditioning in this day and age? Apparently not. I spent the last several days in Minneapolis visiting my sister, and I was shocked to learn that not only does she not have a/c, but that is the norm there?? Call me sheltered, but I never even considered air conditioning to be optional. Though in all fairness, if you live in an area that has snow on the ground for 6 months out of the year, it hardly seems necessary. Sort of like having a heater in the tropics I suppose. It just never occurred to me since I was born and raised in Atlanta. Anyway, I cooked my favorite chicken enchiladas one night, and now I stand corrected and totally get the sentiment of keeping the oven off during the summer. I was literally sweating while standing in the kitchen. So if you are suffering through the summer without air conditioning, this would be a perfect dessert for you. Plus, it is light and refreshing, portable, low-maintenance, and can easily be made ahead. Even though the pistachio macarons seemed to be the runaway hit of my Trashy to Classy Cocktail Party, I was really partial to these strawberries. Strawberries are halved, and a bit of the inside is scooped out. They are then filled with a lightly spiced mascarpone whipped cream filling and sprinkled with cinnamon. The addition of cinnamon and cardamom seemed odd to me, but the spices gave the filling a really nice warmth. I certainly ate more than my fair share while prepping them for the party, and judging by the empty tray at the end of the night, everyone else enjoyed them just as much. Halve each strawberry through the stem-end, and use a melon baller or paring knife to scoop out part of the middle. In a medium bowl, beat the mascarpone, cream, sugar, vanilla, and cardamom until soft peaks form. Using a piping bag fitted with corner snipped off (or a round tip), fill each strawberry with the cream. Sprinkle lightly with cinnamon, and serve. I always thought A/C was a given too. Then I moved to Boston. The first summer here we used our window units maybe twice? These strawberries look really tasty. I can't wait to make these!! Thanks so much for sharing! I always thought A/Cs were a given, as well. And then I moved to Germany. I didn't turn on my oven for three weeks straight b/c it was 90 outside and probably 85 in my kitchen. 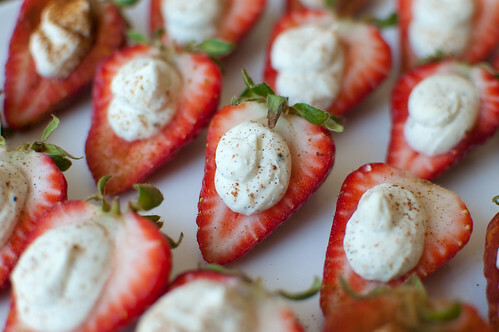 These strawberries look perfect! Do you think they would still be good without cinnamon? I grew up in upstate NY but we still had a/c! Granted we rarely use it haha, but very nice to have. Now that I live in Memphis, I think I would die without it. I still hear of the occasional person without a/c even down here though which kinda grosses me out thinking how sweaty they have to be. Anyway, I love these strawberries. Such a great idea! And perfect for those of us battling the heat! I'm AC free in my house. lol. It's not too bad though, only a few days out of the summer. I just BBQ on those days. Those strawberries are so sweet! I can't wait to make them for a party. Bookmarking them for sure. These sound so yummy. I grew up in ATL with a house with no AC. You adjusted and just moved slowly and we def did NOT use the oven esp in July and August. I remember take out fried chicken was a summer staple....and I preferred it cold the next day. Those are adorable, I also run the oven all summer...no issues here! Lovely! So light and easy for summer. 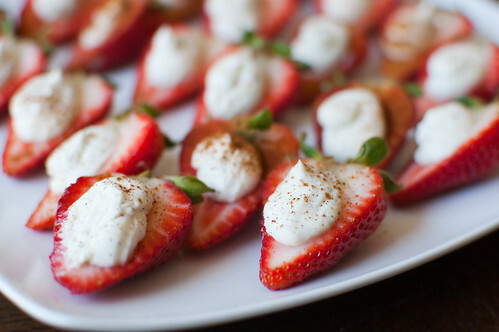 These are really cute and a great alternative to the cheesecake stuffed strawberries. This summer will be my first experience in heat with no AC so this recipe is perfect! And wow, that sounds so delicious... cream of any kind and strawberries are perhaps my favorite combination. Sure, you could leave the cinnamon out. I almost stopped and picked up a flat of strawberries from the farm on my way home from work. I was wondering what I would do with so many strawberries because I couldn't think of a recipe on the fly. After seeing this, I realize that not stopping was a bad decision. These look entirely addicting! Brilliant! I think these would be an adorable addition to baby or wedding shower! fabulous idea... i am sure they taste great too! These were just wonderful! I plan to use then at my next get together :) Also, these taste perfect with a dessert wine!